In putting together scenarios, the key factors are the trigger point for calling a referendum and the nature of the question. Depending on the stage at which a referendum was triggered, planning might begin any time between November and February (or indeed later, if negotiations with the EU drag out). The minimum timescale between the introduction of legislation and polling day is 22 weeks for a two-option referendum, or 28 weeks for a three-option poll. The full range of possible trigger points, questions and timetables are summarised in the figure below. 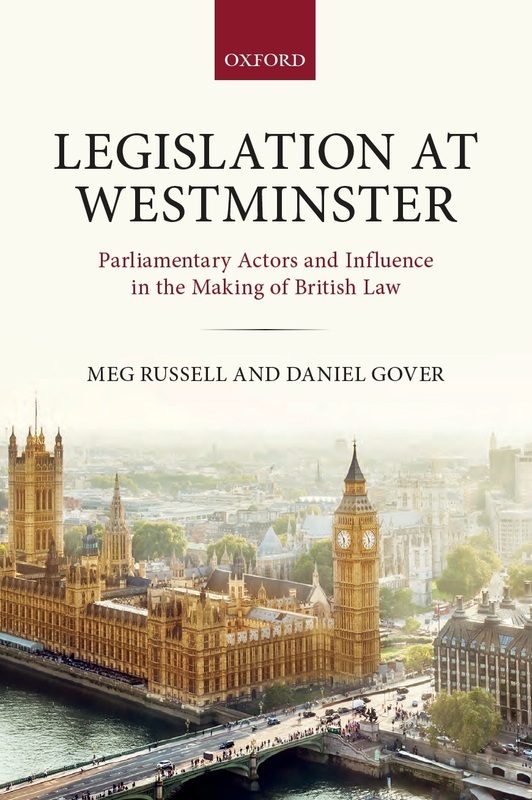 If a deal is successfully negotiated between the UK government and the EU, the European Union (Withdrawal) Act requires that the deal is put to parliament, in what has been dubbed the ‘meaningful vote’ motion. The House of Commons will be able to accept, amend, or reject the motion (while the House of Lords will merely be able to ‘note’ it). If a deal is reached, this is the earliest likely point at which parliament could insert a referendum requirement. If discussions end successfully at the European Council meeting pencilled in for mid-November, this decision could come in late November. At this point, MPs could potentially make approval of the motion conditional on a referendum being called – either formally by amending the motion, or by extracting the promise of a referendum from the government in return for supporting it. If ministers responded quickly to this demand, and brought forward a referendum bill in early December, polling day could occur in mid-May at the earliest, if a two-option question was chosen. At this stage the two options would likely be ‘deal’ versus ‘remain’ (the formulation preferred by many supporters of a second referendum). However, some would argue that three options should be put to voters – including a ‘no deal’ option. If that question format were agreed, a referendum could take place no earlier than late June 2019. There is plenty of room for slippage in these timetables: if agreement of a deal with the EU was delayed beyond mid-November, or the government delayed bringing forward a referendum bill after the House of Commons had demanded this, or if the passage of that bill was heavily contested. Hence these posited polling days should be read as the earliest possible, and could easily slip. If a deal is reached, and MPs simply approve the ‘meaningful vote’ motion, the government will bring forward an EU (Withdrawal Agreement) Bill to implement the deal. The bill provides a second opportunity for parliament to impose a referendum requirement. If this occurred early in the Commons stages – at second reading, or the start of committee stage – a two-option poll (offering ‘deal’ versus ‘remain’) could potentially take place in early June 2019. A three-option referendum triggered at this point could not be held until at least late July. As discussed below, a referendum this late could cause significant problems for the European Parliament elections. Even more delay would occur if a referendum requirement was inserted during the House of Lords stages of the bill. This would be peers’ first opportunity to set conditions for approving the deal. 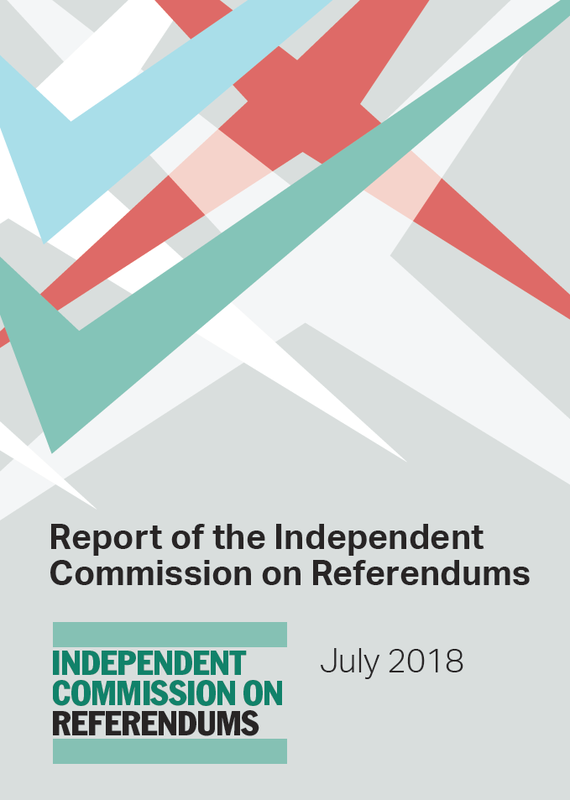 But a referendum requirement inserted by the Lords, particularly if disputed by the government (as seems likely), and fought out during ‘ping-pong’ with the Commons, would not allow a two-option referendum until at least late July 2019, or a three-option referendum until September. As in the previous scenario, slippage to any of these timetables is very possible. If the House of Commons simply rejected the ‘meaningful vote’ motion, rather than accepting it or making it conditional on a referendum, this could also trigger a referendum. Here the politics would be more acrimonious than in the previous scenarios. There could also be a difference in the resultant referendum question. Parliament, having rejected the deal, might not wish to offer it to voters, and instead favour a ‘remain’ versus ‘no deal’ referendum. But this seems unlikely. It is far more probable that the government would argue for keeping the negotiated deal in play, and parliamentarians might well concede that the public should be given a voice on the deal – which would result in a three-option poll. Following rejection of the ‘meaningful vote’ motion, the government would be required to bring forward a ‘neutral terms’ motion explaining its intended next steps. It is unclear whether MPs will formally be able to amend this, but they could if necessary use other mechanisms (e.g. an opposition day) to force a vote – which on such a major issue would in practice prove politically binding on the government. Alternatively, ministers themselves might seek a way out of the gridlock by proposing a referendum to go over the heads of MPs and straight to the voters. The acrimony of such political proceedings would make delays even more likely than under the scenarios above, but a two-option vote might in theory be held as early as mid-June 2019, or a three-option poll by late July. If the government fails to reach a deal this creates an alternative route to a referendum. Negotiations could break down at any point, but in the absence of agreement are likely to continue into the New Year. The European Union (Withdrawal) Act then sets a deadline of 21 January, after which the government must lay a statement before parliament setting out its intended action, followed by a ‘neutral terms’ motion for debate. This motion might be considered in early February. Since the majority of MPs wish to avoid a ‘no deal’ Brexit, a decision to call a referendum is quite likely at this point. In this scenario, there being no UK–EU deal, only two options would remain on the table – meaning the question would straightforwardly be a two-option one, offering a choice between ‘remain’ and ‘no deal’. The 22-week minimum preparation period would lead to an earliest possible polling day in mid-July 2019. The lack of alternative options might make delays to this timetable less likely than under other scenarios. Although the government and the EU are working towards a deal, and pressure will mount if the timetable drags on, there is always some possibility that negotiations continue beyond January. In this case, an extension to Article 50 would be necessary simply to continue negotiations (though there is no certainty that the EU would grant this). If this occurred, any of the scenarios above could play out at some time in the future, leading to an even later polling day. Any of the above scenarios would clearly require an extension to the Article 50 period, which currently expires on 29 March 2019. As discussed in an earlier post, EU leaders would be very likely to agree this for the purposes of a democratic exercise. In practice, if they gave early indications that an extension was likely, this process might proceed in parallel with the preparation of legislation on a referendum, requiring no further delay to the timetables above. Any such extension would clearly need to run beyond polling day, and also take account of the referendum’s possible outcomes. A vote to remain in the EU would require little further preparation (beyond the European Parliament elections, discussed below). A decision to leave without a deal would require time for both the UK and the EU27 to implement necessary arrangements (current EU thinking is that at least three months would be needed), while the ability to leave with a deal would depend on whether the EU (Withdrawal Agreement) Bill, which must be passed for the withdrawal agreement to be ratified, had already been approved. In practice an Article 50 extension until late 2019 might be required. The May 2019 European Parliament elections create the most awkward obstacle in extending Article 50. The new MEPs will take their seats on 2 July, and if the UK is still a member state then it should under the treaties hold elections and send MEPs. The least disruption to this process would result if, in the event of a ‘remain’ vote in a referendum, the UK could subsequently hold European Parliament elections before 2 July. This could occur only under the very first scenario, of a two-option referendum triggered at the ‘meaningful vote’ stage (and even then the timetable is uncertain). It is conceivable that some political fudge could be found between the UK government and the EU to delay the elections further. But this might hamper some European Parliament business (notably the election of the new President of the European Commission), and difficulties would mount if the delay extended into the autumn. A referendum triggered during the Commons stages of the EU (Withdrawal Agreement) Bill, or called quickly following failure to reach a deal, might be accommodated. But a referendum triggered during the Lords stages, for example, could become really quite problematic. Under scenario E, where Article 50 is extended simply to continue negotiations, the European Parliament elections would presumably need to be held as scheduled in May. We have seen that there are various routes to a further Brexit referendum. How likely these are remains uncertain and subject to unfolding political events, including whether the government reaches a deal with the EU, how public opinion on Brexit develops, and the positions taken by the political parties and individual MPs. There are many key factors discussed in our report, and blog series, that politicians must take into account in thinking through the options. These include the need for careful preparation, and the choice of question – both of which could have a major impact on voters’ willingness to accept the referendum outcome as legitimate. The key deciding factor for whether a referendum takes place will ultimately be the views of MPs. As demonstrated in the scenarios above, if MPs do decide to press for a referendum, and want to avoid accusations that they are creating intractable timetable problems regarding Article 50 and the European Parliament elections, they need to take responsibility for this themselves, not rely on action by the Lords. They might, of course, opt for a path that does not involve a referendum. But if they do want one, they should act quickly. 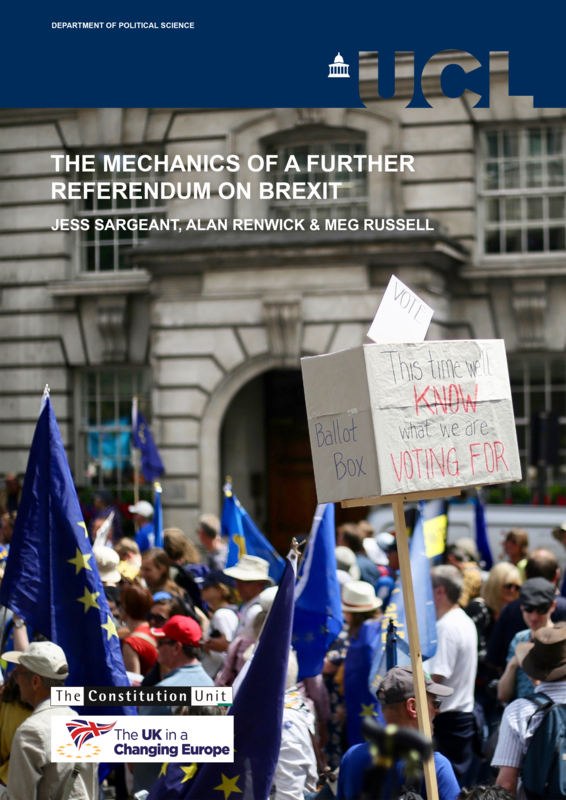 The Mechanics of a Further Referendum on Brexit, by Jess Sargeant, Alan Renwick and Meg Russell, is published today by the Constitution Unit, jointly with the UK in a Changing Europe. It is downloadable from this link, which also provides links to the previous blog posts in the series. Meg Russell is Director of the Constitution Unit. 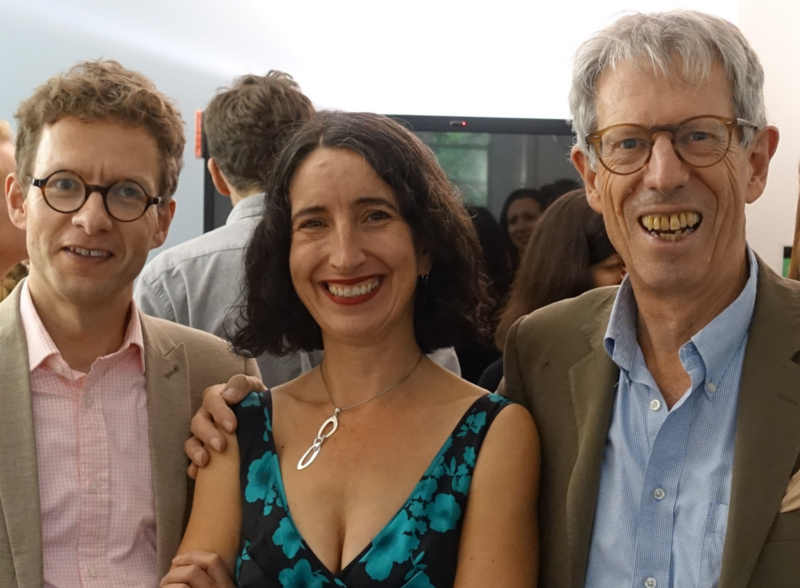 Alan Renwick is Deputy Director of the Constitution Unit. Jess Sargeant was a Research Assistant at the Constitution Unit between July 2017 and September 2018, working on referendums. 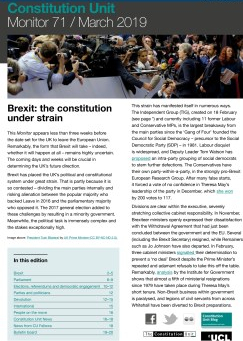 This entry was posted in Brexit, Elections and referendums, Europe, Parliament and tagged 2019 European parliament elections, Alan Renwick, Article 50, Brexit, Brexit and parliament, Brexit referendum, Electoral Commission, EU (Withdrawal Agreement) Bill, European Union (Withdrawal) Act, exit day, Jess Sargeant, meaningful vote, meg russell, neutral terms motion, no deal Brexit, People's Vote, question testing, referendum bill, second referendum, The Mechanics of a Further Referendum on Brexit, withdrawal agreement. Bookmark the permalink.